This week I’m just here to offer my hearty endorsement of a novel which may not be known to all. It’s called The Leopard, by Giuseppe Tomasi di Lampedusa, although its original Italian title, Il Gattopardo actually translates to the cat known as a serval. Not to sound picky, but actually translating the title properly would have been polite. 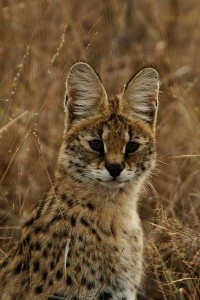 Alright, not as impressive as a leopard, but look at those ears. Magnificent. The novel, which is available in Archibald Colquhoun’s excellent English translation, describes the langour of a Sicilian nobleman called Don Fabrizio who realises that, with the unification of Italy making the world a smaller place, his may be the last life of luxury in the country. The novel’s main events focus around the marriage of his dashing nephew Tancredi. What makes the book so captivating is the utterly unique style it’s written in: it’s so luxurious, so indulgent, so gorged with Sicilian aristocratic life that reading it actually acts as a substitute for one of your daily meals. Tomasi enjoys his description. He will not simply give you a scene. He will tell you what the wallpaper is, what herbal scents are in the air, the density of the air — it’s overpowering. But not overwritten. It’s exactly as it should be. It’s not style over substance either. Tomasi wields metaphors and similes like heat-seeking missiles, but with the agility of a samurai sword: he casually describes two of the attractive guests at a generally-unattractive ball as ‘swans over a frog-filled pool’, for instance. There is a film which for some reason stars Burt Lancaster and by most accounts is very good. This book is a joy though, and one of those which will make you want to stop every five seconds and write down some particularly apt aphorism or piece of description. As we all know, those are the best kind of books.